Is Unilateral Laparoscopictep Inguinal Hernia Repair a Job Half Done? a Case in Favor of Bilateral Repairs. Method:150 Laparoscopic TEP operations were performed in 75 patients (Group A) prospectively and were compared with 75 unilateral TEP operations (Group B) in age-matched controls done previously by the same surgeon. All cases were performed under general anaesthesia and the TEP repair was performed using 3 midline ports. All uncomplicated patients were discharged at 24 hours in keeping with department policy. Results:Of 75 patients (Group A), 25 (33.3%) were clinically diagnosed with bilateral hernias and the rest 50 (66.66%) were unilateral hernias.The distribution of the 25 bilateral cases was 11 bilateral direct and 14 bilateral indirect inguinal hernias.The distribution of the 75 age-matched controls (Group B) was of all unilateral hernias of which 47 were right sided and 28 were left sided. There were 23 direct hernia and 52 indirect hernias among the control group. The mean operative time for all 150 cases was 76.66 ±15.92 mins. The operative time in the control group (unilateral hernias) was 66.16 ±12.44 minutes whereas the operative time in the test group (bilateral repair) was 87.2 ± 11.32 minutes. The operative time in comparison was significantly higher in the bilateral group by 21.04 minutes or 31.88% (p value=0.000, significant).The operative time in the true unilateral group was 82.45 „b 9.38 mins while the operative time in the former group (OCH + Bilateral hernias) was 91.35± 11.95 mins, which was a significant difference statistically (p value=0.0015). Occult hernia was seen in a total of 15 cases of which 13 were occult contralateral hernias (OCH) (26%) and 2 were ipsilateral occult hernias. The mean operative times in the OCH cases were 81.46 ± 7.9 minutes whereas in those without OCH was 82.45 ± 9.38 minutes which is not a significant statistical difference (p value=0.46). Complications – There were 14 cases of peritoneal rent in the bilateral repairs group whereas in the unilateral group 10 were noted to have a peritoneal rent intraoperatively. There were 12 cases of subcutaneous emphysema in the bilateral TEP group whereas only 4 such cases were seen in the control group. This difference in the incidence of subcutaneous emphysema was statistically significant (p value=0.026).There were no cases of seroma, hematoma, wound infection, visceral injury or post-operative neuralgia in either Group A or Group B. Pain: On statistical analysis, the VAS depicted pain scores at 12 hours only was significantly higher in the Unilateral repair group as compared to the biilateral TEP group. The VAS scores at all other times were not significantly different, statistically, between the 2 groups. Return to work:The average time of return to light routine or activities of daily living was 1 day in Group A whereas in group B it was 1.91 days (range 1-3 days). This was a statistically significant difference (p value=0.000). Recurrence:There was 1 cases of recurrence in this study on the right side in a clinically left sided hernia in Group A, over a mean follow-up period of 4872 months and all patients reported to follow up by office visit or correspondence till 2 years and 2 patients were lost to follow up after 2 years. Among Group B, there was no recurrence over a follow-up period of 40-54 months with 3 patients lost to follow up after 3 years. Conclusion:In the present study bilateral TEP was performed in 3 types of patients, those with clinically bilateral hernias, those with clinically unilateral but with an OCH, and finally in truly unilateral hernias. All of them were compared to unilateral TEPs in clinically unilateral hernias, and we found no significant increase in morbidity, pain, recurrence or complications in bilateral repairs. Convalescence, from the surgery, as gauged by the return to activities of daily living and return to work parameters, is also comparable. Surgeons experienced in laparoscopic TEP, in high volume centers can, and should, provide bilateral repairs in all patients of inguinal hernias keeping in mind the potential benefits versus the comparable morbidity. 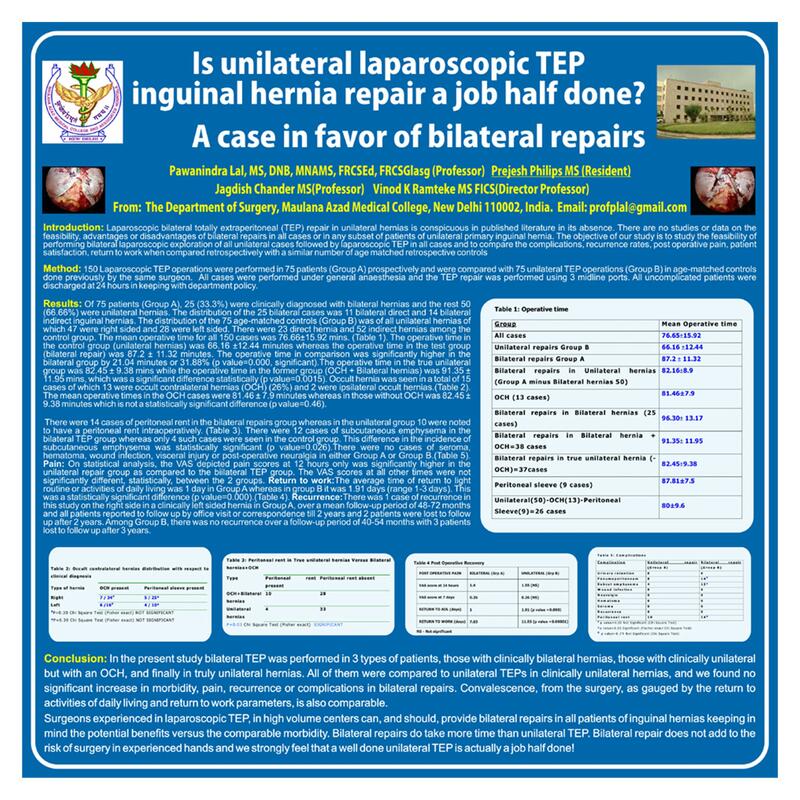 Bilateral repairs do take more time than unilateral TEP. Bilateral repair does not add to the risk of surgery in experienced hands and we strongly feel that a well done unilateral TEP is actually a job half done!